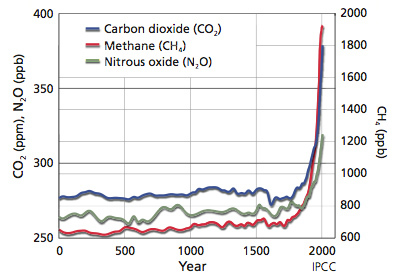 Increases in concentrations of these gases since 1750 are due to human activities in the industrial era. Concentration units are parts per million (ppm) or parts per billion (ppb), indicating the number of molecules of the greenhouse gas per million or billion molecules of air. Carbon dioxide concentrations in the atmosphere have increased due to the use of fossil fuels in electricity generation, transportation, industrial processes, and space and water heating. A few percent of global CO2 emissions are produced during the manufacturing of cement. Deforestation provides another source of carbon dioxide, and reduces its uptake by trees and other plants. Globally, about 80 percent of human-induced carbon dioxide emissions comes from the burning of fossil fuels, while about 20 percent results from deforestation. Methane concentrations have increased mainly as a result of agriculture, raising livestock (which produce methane in their digestive tracts), mining, transportation, and use of certain fossil fuels, and decomposing garbage in landfills. About 70 percent of all methane emissions are now due to human activities. Nitrous oxide concentrations are increasing as a result of fertilizer use and fossil fuel burning. Water vapor is the most important and abundant greenhouse gas in the atmosphere. Human activities directly produce only a small increase in water vapor through combustion processes and irrigation. However, the surface warming caused by human-produced increases in carbon dioxide, methane, and other greenhouse gases leads to a large increase in water vapor, since a warmer atmosphere holds more moisture. For every 1°C (1.8°F) of warming, the amount of water vapor in the atmosphere increases by about 7 percent. This in turn leads to substantially more warming, creating a feedback loop. Halocarbons, ozone, and sulfur hexafluoride also trap heat.